Hi! I’m Faith. I edited this post on March 29, 1016 (original was from 11/23/2011) because due to a Pinterest share it has proven to be my most popular post ever, with new readers checking it out daily. 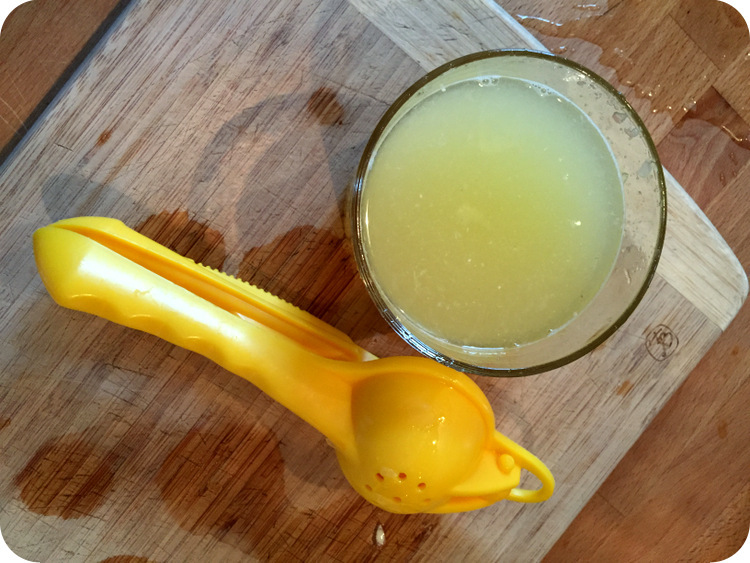 The original post was nothing special, a little blurb about putting nutritional yeast in my oats (which I don’t eat regularly anymore because of my tendency towards cold sores), a bit about lemon water for breakfast, and a happy thanksgiving to close. It was the lemon water that keeps yall coming to this post though, that little magic trick I shared of juicing lemons into an ice cube tray then freezing for super easy daily lemon water. It is a pretty awesome ‘hack’, so here’s that post from November 2011, with updated pictures because I lost the other ones in the blog-hacking fiasco of 2015. I also love starting my day with lemon water but sometimes I am too lazy to squeeze it. It’s not as much about the squeezing but the dirty dishes of the knife and squeezer that is sometimes enough to make me forget the whole thing. But not any more. 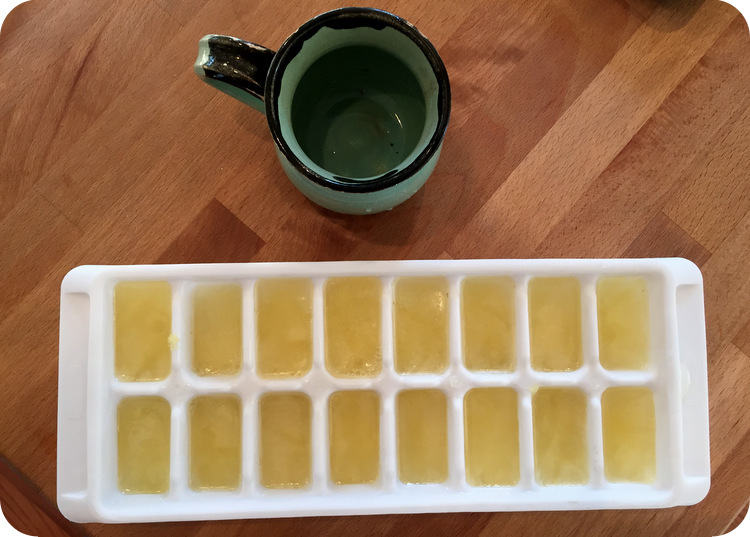 I filled an ice tray with straight lemon juice and set it in the freezer. Now, each morning I just heat up a little water, toss a cube in, and sip my lemon water! 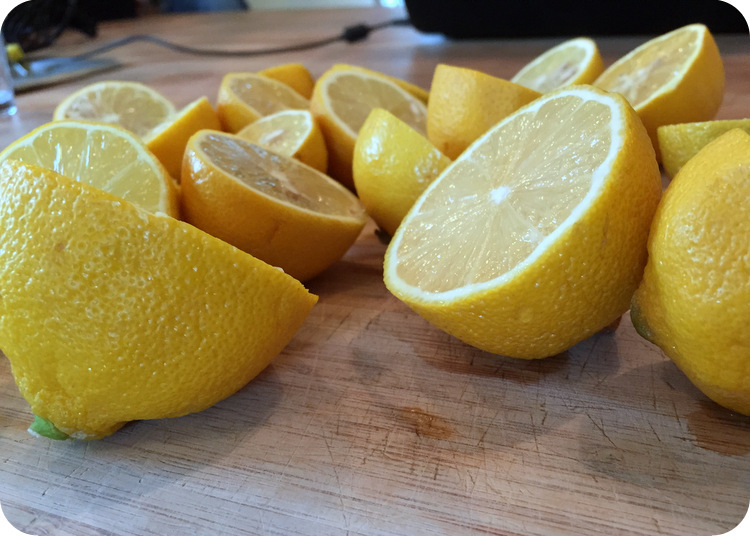 Lemons are alkalizing to the body and thus an antidote to all the acid forming food in our modern diets. They are also cleansing and stimulating for the liver and kidney. 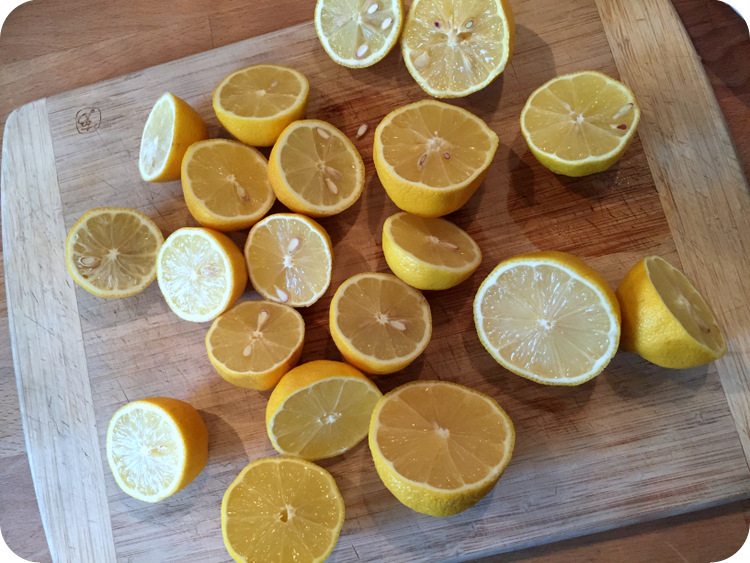 Lemon juice is great for digestion and bile movement, meaning it clears you out in a few ways. The tartness is also great to help wake me up! Occasionally I’ll add a bit of honey but usually I like it straight up. They’re good stuff. Insoluble and soluble fiber, complex carbs, b vitamins, phytic acid. Phytic acid…isn’t that an anti-nutrient that blocks the bodies ability to absorb certain minerals? Oats, like most beans, grains, nuts, and seeds, have phytic acid. This anti-nutrient binds to calcium, magnesium, iron, and zinc (and other minerals in lesser degrees) and makes them unabsorbable to the digestive system. I’m a nutritarian and while I get a whole lot of pleasure out of the act of eating, I’m also interested in getting maximum nutrition from my food. This means that if I can make my morning oats more nutrient dense and still delicious than I’m all for it. Soaking grains, beans, seeds, and nuts in warm water and a little acid (from yogurt, kefir, lemon juice, whey, or apple cider vinegar) for several hours breaks down much of the phytic acid and voila-the minerals are now available for your digestive system to utilize! At night I put my oats, warm water, and a teaspoon or two of acid (usually yogurt) into a pot with a lid and let it sit on the (turned off) stove overnight. In the morning I cook the oats as usual except that they don’t take as long because they’ve been absorbing water all night. I do this with other grains too; quinoa, rice, amaranth and all of my beans. Many of you are probably already getting the benefits of soaking oats without knowing it by eating Overnight Oats, as long as you add a little yogurt or kefir to the mix. Soaking grains may also make them easier to digest by neutralizing the enzyme inhibitors so if you have noticed mild digestive problems you may want to give it a try. You can soak flour too! Here’s an awesome recipe for soaked English Muffins. Are beans, grains, seeds, and nuts bad for you if they’re not soaked? In my opinion, no. But I do believe that soaking is an easy way to make them even better for you.